A multi-directional musician who shifts easily from straight ahead jazz with drumming great Ben Riley’s Monk Legacy Septet and the Mingus Orchestra (a regular gig he’s had for ten years) to Indian ragas with Dharma Jazz and acoustic world music with Trio del Sol, to soothing bossa novas and grooving sambas on two previous recordings – 1998’s Brazilian Rosewood and 1999’s Boogaloo Brasileiro — guitarist Freddie Bryant expands his ever-widening musical palette on Live Grooves…Epic Tales. 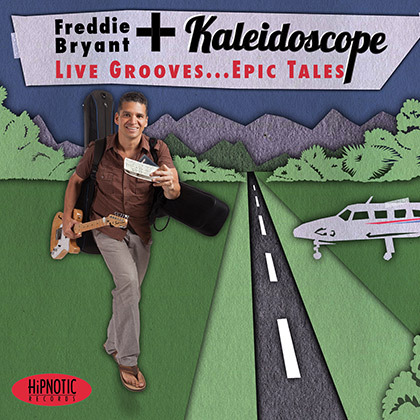 Many of the tunes here reflect Bryant’s whirlwind touring experience in recent years on state department-sponsored trips to Papua New Guinea, Singapore, India, Burma, Cuba, Mexico, Senegal, Malawi, Tanzania, Madagascar, Ethiopia and other exotic points on the map. His buoyant party tune “La, La Ohh!,” in fact, was written on the back of a boarding pass on a plane ride from Manila to Japan as is reflected in the CD cover art. Throughout the CD, Bryant deftly shifts between three guitars. His main axe here is a Fender Telecaster, which he uses to good effect on the relaxed “Blues Koan,” the dark, gospel-infused, Mingus flavored 3/4 number “Goddess,” the bristling Hermeto Pascoal flavored baiao “Passages,” the infectious “Bo Diddley,” which neatly segues from a 3/2 clave to an alluring samba groove, and a cover of organist Billy Gardner’s “Boop Bop Bing Bash.” The entrancing and intricate Indian-meets-Middle Eastern number “Drum On, Drum On,” written for his collaborator and Ravi Shankar disciple Shubhendra Rao, and “Beginner’s Mind” both feature his accomplished finger-style playing on 12-string acoustic guitar while the breezy “La, La, Ohh!,” the melancholy, minor key “Alone” (with Bryant reciting the words of a Maya Angelou poem) and the beautiful closer “Bolero” have him exhibiting brilliant finger-style technique on a nylon string acoustic. It’s a compelling ‘read’ by one of the most gifted and versatile guitarists on the scene today.